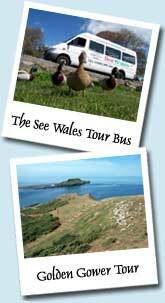 Guided sight seeing mini coach tours around wales. Press the above link and make one payment for all people and all tours. 1. 'Description' = type all your tour dates & number of people. 2. 'Price per item' = enter the total price for all tickets, all tours, all people. 3. 'Quantity 1' = ignore this. 5. Now select log in (PayPal) or Pay by Debit or Credit Card. 2019 Prices - Day tours !REDUCED! See Wales Tours will send you confirmation by email. Please ensure you have access to your email when you visit to receive updates about the tour. This is very important! 1. Rejected payments are sometimes due to an incorrect address. Please ensure the address you input is the same as your card providers details. 2. See Wales Tours will confirm your booking by email. This may not happen immediately. We endeavour to reply within 48 hours. 3. We do not issue paper tickets. Your name will be on our tour schedule. We'll be expecting you. Contact us if you would like assistance.